Have you ever set up a chocolate fountain at a home party? 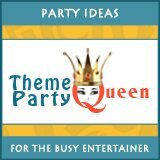 The first time I did was for my daughter's high school graduation theme party. Rather than have a cake or cupcakes, I decided it was much more interesting. Boy, did the kids agree! Not only did my daughter's friends love it but our friends loved it too. There were people standing around it all night eating and gabbing with their friends. 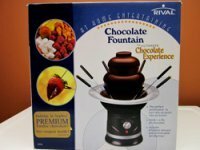 Mine is the Rival CFF4 Chocolate Fountain, bought in 2007. It is very easy to set up and level properly. It doesn't take long for the chocolate to start flowing. The only problem I had was with clean up. It took longer than I would have liked because I washed the pieces by hand. Most models you buy now are dishwasher safe making clean up alot easier. Watch for that when you buy one. When I used it for the graduation theme party, I set it on a table in my kitchen and surrounded it with dippers including pretzels, shortbread, Oreos, strawberries and marshmallows. I chose this spot for a couple of reasons. First if there were accidents, it would be on my wood kitchen floor as opposed to my carpeted dining room or rec room. Second, this spot is easy for people to gather as there is plenty of room all the way around the table. Plan on setting yours up in a similar, large area because people tend to congregate there. My Rival model is no longer available, but I found several others that have great reviews and would be perfect for any theme party especially those with kids involved. You will also find several of our favorite fondue pots, fondue chocolate and recipe books. If you need some ideas for great dippers, we added the best shortbread recipes here. So yummy dipped in warm chocolate!